We love posting announcements about rain barrel sales and subsidies because they demonstrate the big trend in RWH- namely that rain barrels have gone completely low cost and DIY. A few years ago a rain barrel was easily $100 but nowadays you can either get one for free (if your town has a program) or easily make one on your own for $25-$50. Among our customer base, the DIY crowd is in full force, and we continue to get a lot of questions about how to install a spigot and tie down a barrel. Most of these folks are pretty comfortable with buying the parts at the local hardware store and setting everything up. But a few months ago we started thinking it might be nice to save them the trip with a fixed bag of parts. 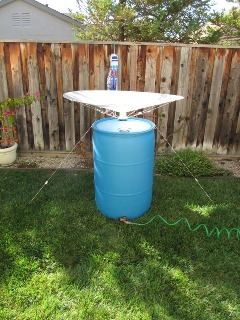 The result: we are now able offer customers our own DIY standalone rain barrel kit (see picture left). - 2 Double Loop Cables: one loop secures to the barrel while the other loop can be used to secure the unit by s-hook, stake, or heavy object. - 1 S-hook: enables barrel to be secured from underneath by connecting double loop cables to each other. - 2 Heavy Duty Steel Stakes: enables barrel to be secured to ground by connecting each double loop cable to a Stake. - 1 Single Loop Safety Cable (Optional): used with the 59" RainSaucer™, this cable creates a connection between the edge of the RainSaucer™ and the barrel and is used for safety purposes. - 2 10' Cables (Optional): also used with the 59" RainSaucer™, this extra set of cables lets the user keep their first full barrel in place so they can take their 59" RainSaucer™ to a second barrel. The goal is easy system expansion. - Instructions: provides step by step instructions on how to install on either an open top or closed barrel. The kit has two main applications. The first and most obvious one is to complete your first RainSaucers™ system. 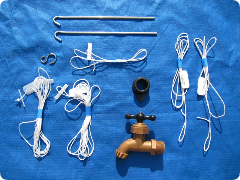 But this kit can also be used to let you expand your water storage. In other words, once your first barrel is full, you can use this kit to port your RainSaucer™ to a second barrel. Then you can switch back between barrels with ease so that you always have one collecting rain while a second (or third) is ready for use. 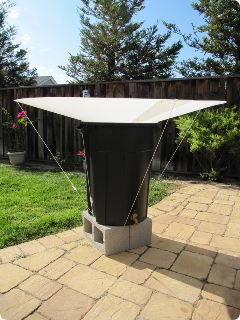 This new DIY Standalone Rain Barrel Kit is being offered for $15, shipping included. We also sell the necessary hole saw for $8. Click here to see more photos. See our Buy page for purchase information. Also see Instructions.